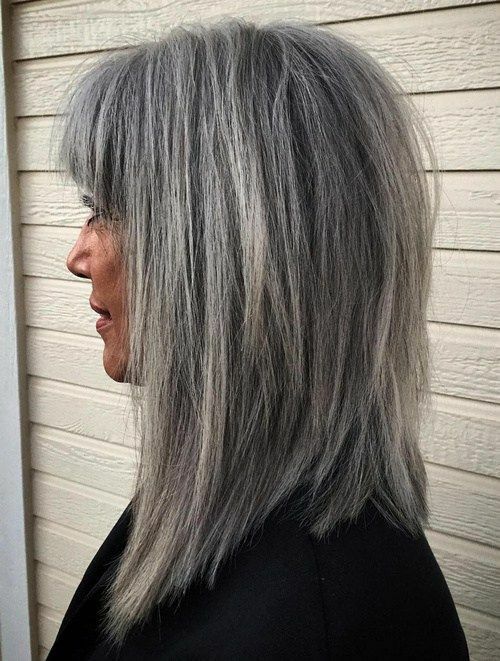 Girls, young ladies and women of all ages love medium haircuts with bangs, and all for a very good reason. 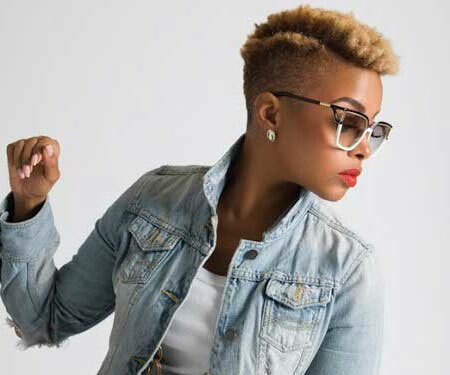 It’s a chic, playful choice for haircuts and can be styled in a myriad of different ways. Medium haircuts with bangs are wonderful for all sorts of textures and types of hair. 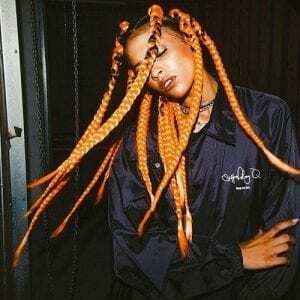 No matter if you have thin and straight locks or thick and abundant curls, a medium haircut with some artfully sliced bangs can look amazing on you. If you want to change your look and you’re interested in medium haircuts with bangs, take a look at the 50 fabulous ideas we collected and use them as inspiration! 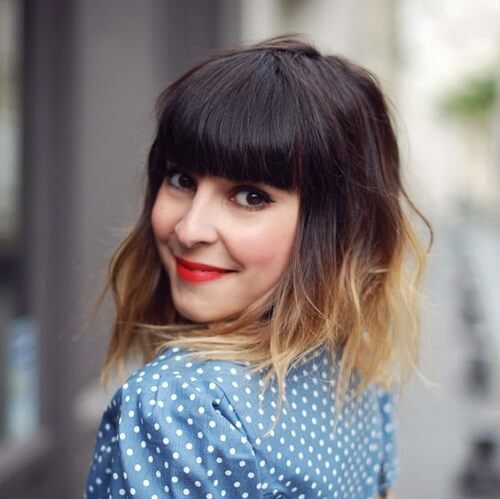 Check out these gorgeous medium haircuts with bangs! 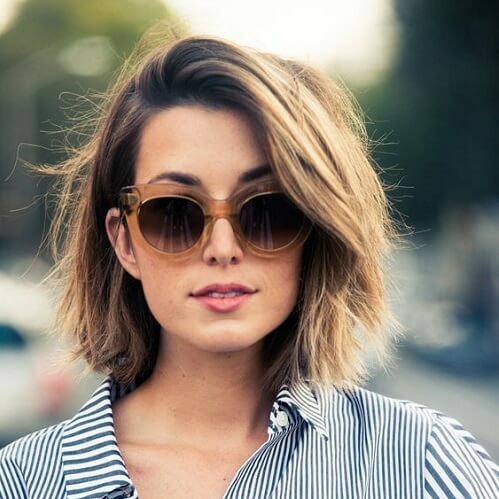 If you want a classy look you can rock every day, regardless of your environment, you can go for this shoulder-length haircut with side-swept bangs. Set your spirit free with these adorable boho front bangs, styled with medium wavy hair. 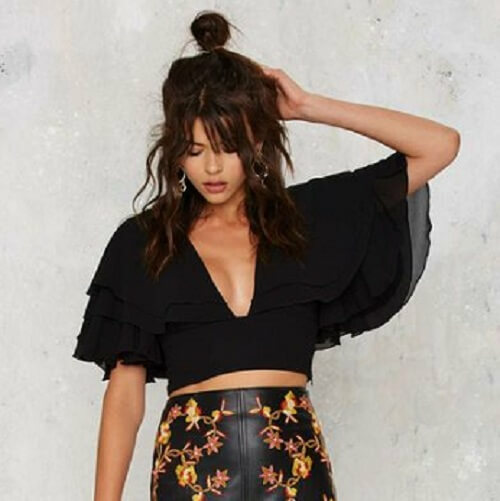 This is the style for the bohemian at heart. 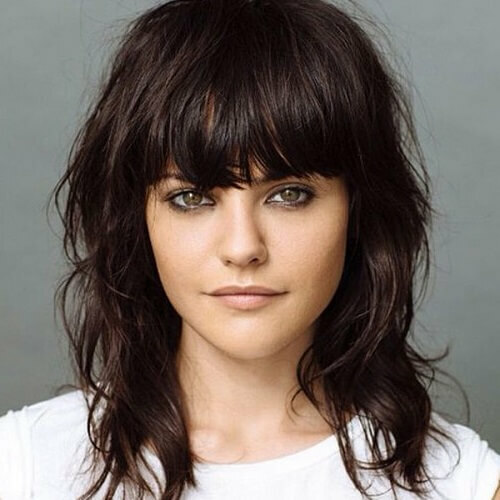 Medium to long hair looks great with eyebrow-length bangs swept casually to the side. Like the first look on our list, it works for all occasions. 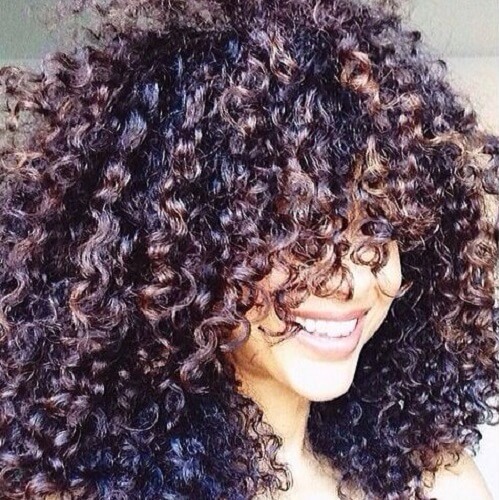 We’re all up for textures, especially if you have slightly wavy or thick straight hair. 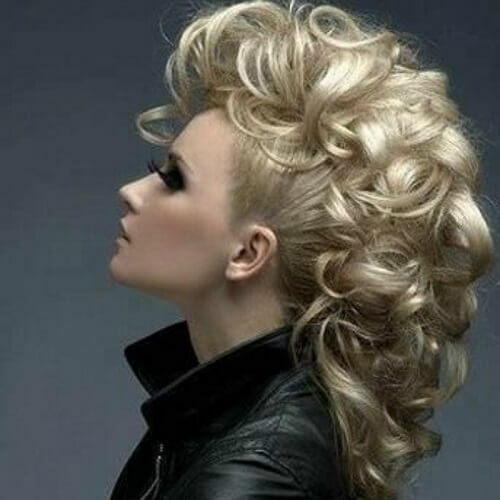 This is a stylishly rugged look that looks absolutely outstanding with side-swept bangs. If you don’t want to venture into a classic short bob, you can leave it a bit longer and match it with some side swept bangs. 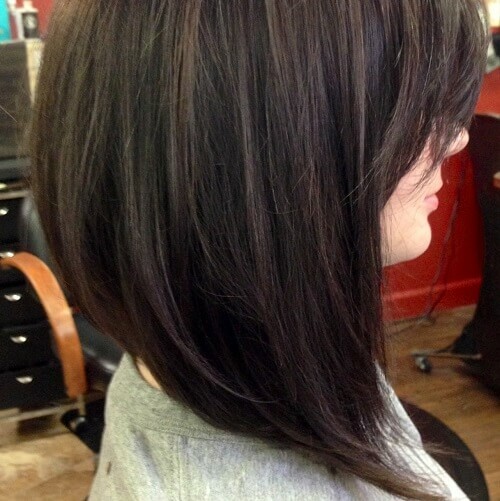 Get some extra boost with a well-cut long bob and a bit of teasing at the top! Don’t forget the side bangs. 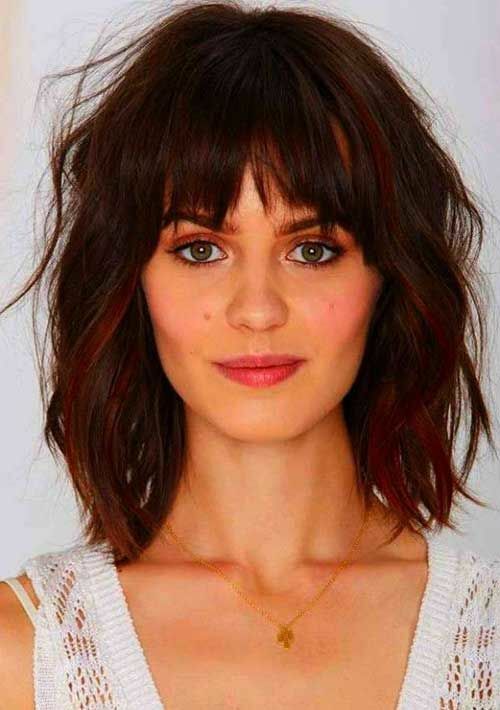 Embrace your naturally wavy hair and go for a bob with some lovely side bangs. In the mood for contrasts? 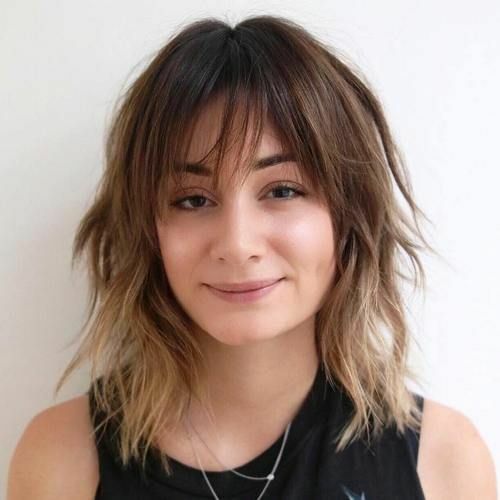 Try a shoulder-length ombre with full, straight bangs. It looks stunning. 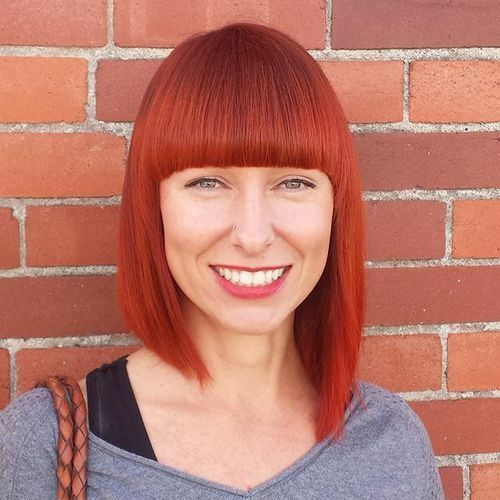 After you do research on medium haircuts with bangs, you should look into color options too. 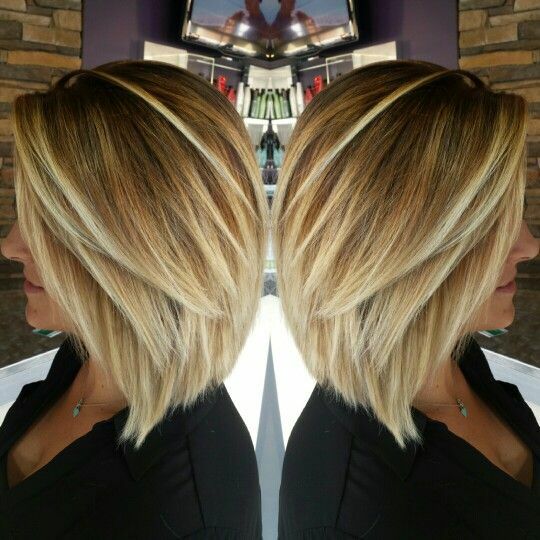 Honey and light blonde highlights and lowlights are the perfect option. 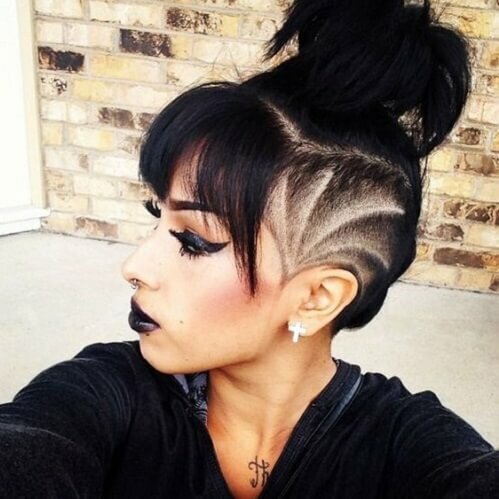 Want to combine edgy and cute in one fabulous haircut and style? 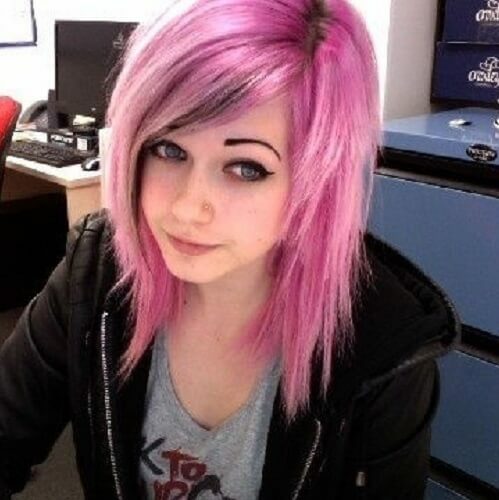 Get out of your comfort zone and dye your hair purple, cut it to your shoulders and design V-shaped bangs that will make you stand out from the crowd. Your color options don’t stop there. 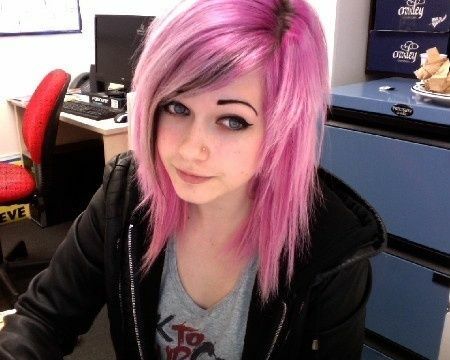 Medium haircuts with bangs also look fantastic with brighter shades, such as pink or magenta. 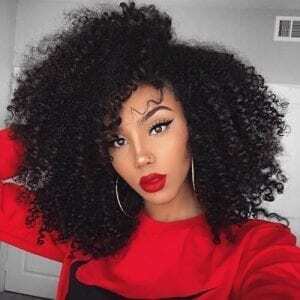 If you are the lucky bearer of natural curls, let them bounce freely around your face with one of the cutest medium haircuts with bangs for afro hair. Obsessed with high-end fashion? 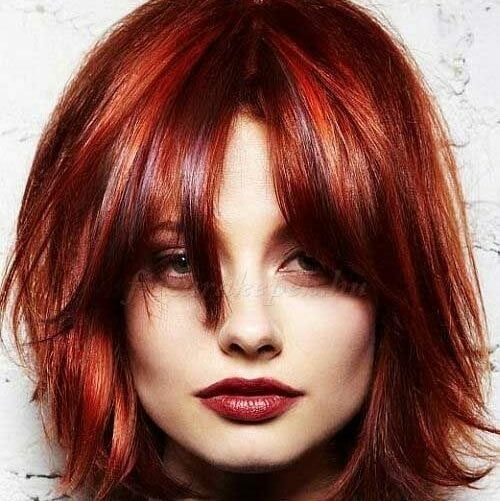 Your haircut can mirror the latest runway trends if your hair is naturally straight. 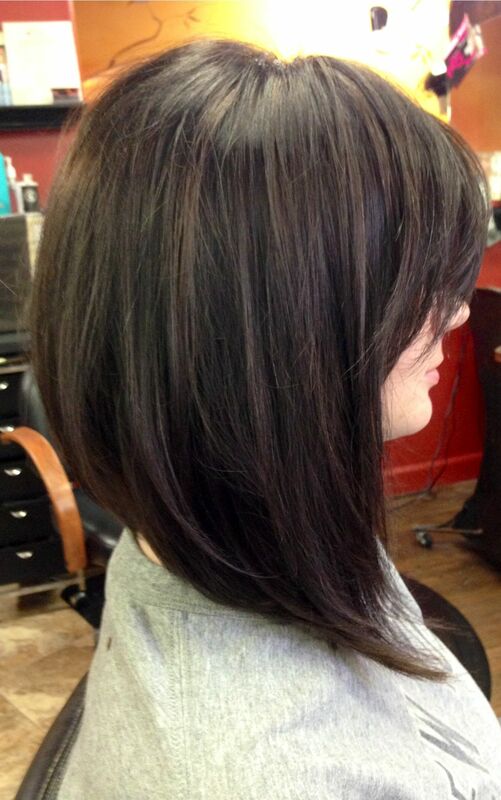 Chop your hair into a short bob with super straight, flawless bangs. The A line bob looks nothing less than amazing and it’s easier to maintain that you’d think. Top it off with some pretty side-swept bangs and you’re good to go. 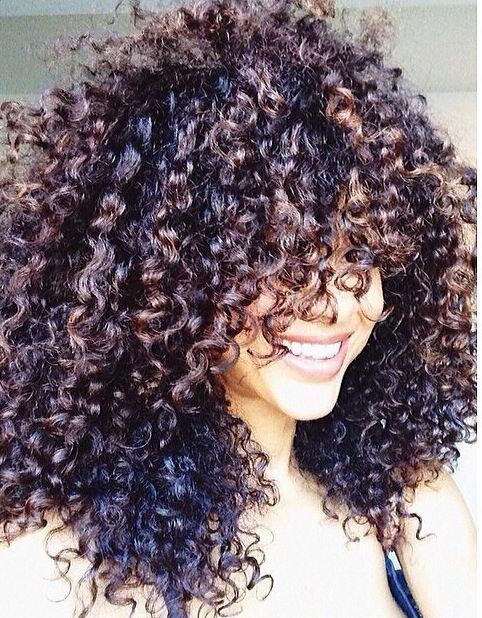 Full, thick and gorgeous: this is how numerous medium haircuts with bangs look like. 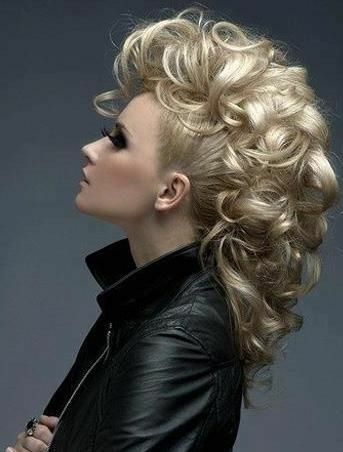 Even though it might not work if your hair isn’t thick, this is definitely an idea to consider. Messy is the new classy. Who would have ever thought that you could get a carelessly stylish look without even trying? Growing your bangs out? This is an excellent idea for you. Casually sweep them to the side for an all-natural and beautiful look. Emo-inspired bangs are adorable. Not only do they give off a young and fresh vibe, but they’re surprisingly easy to style if you get them cut properly. Consider straight bangs that gradually get longer as they curve towards your ears. 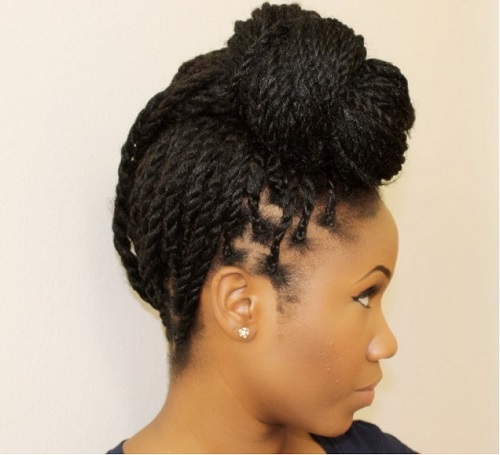 After that, wrap the rest of your hair up in a big bun. 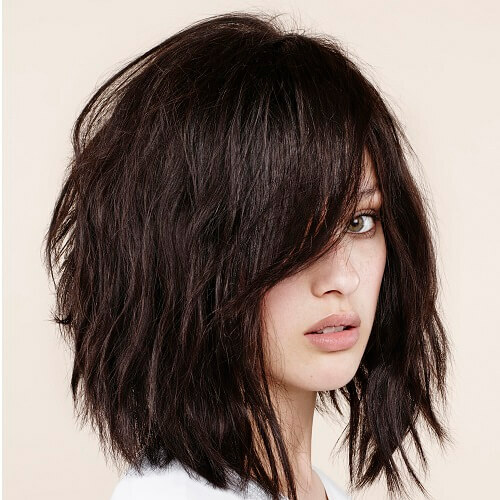 Even though these types of medium haircuts with bangs aren’t as trendy today as they were in the 90s and early 2000s, we warmly recommend them to ladies who have suitable face shapes. 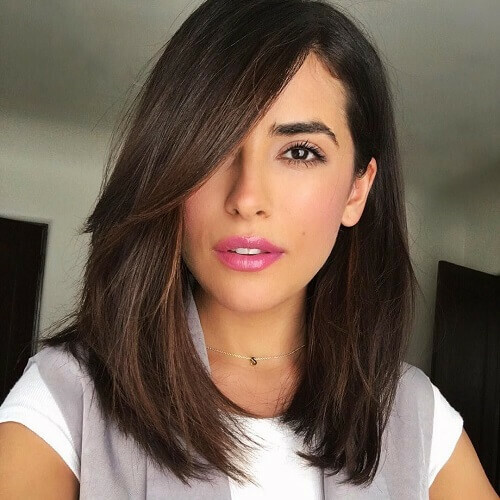 It might seem counter-intuitive to part your bangs at the middle, but if celebrities like Mandy Moore, Penelope Cruz or Jennifer Lopez can rock them, you sure can. 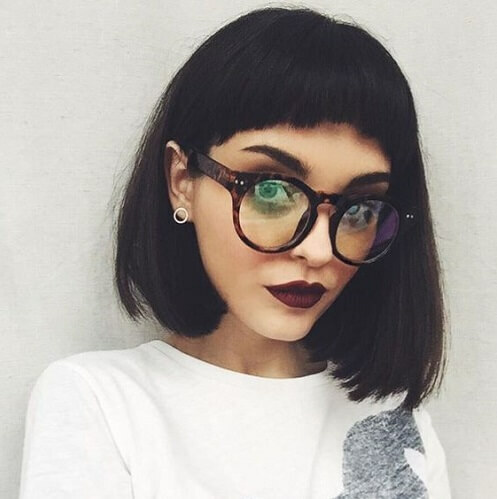 Short bangs might not be for everyone, but they’re perfect for girls with an edgy personality and naturally straight hair. 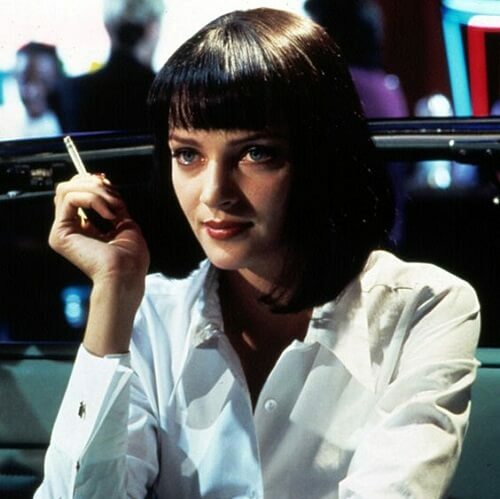 In love with retro fashion? Then welcome to the glamorous world of pin up medium haircuts with bangs. 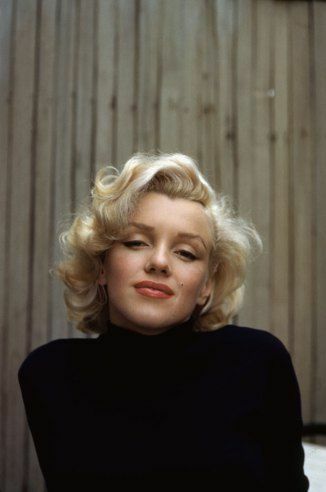 This is just one example, with beautifully curved bangs and curled hair. If you want to get rid of hassle with heavy maintenance, go for some feathered bangs that naturally fall on your forehead. 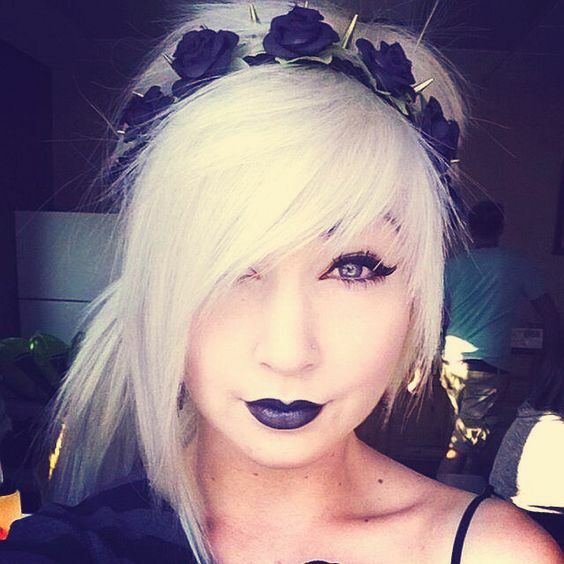 This works for side and front bangs alike. 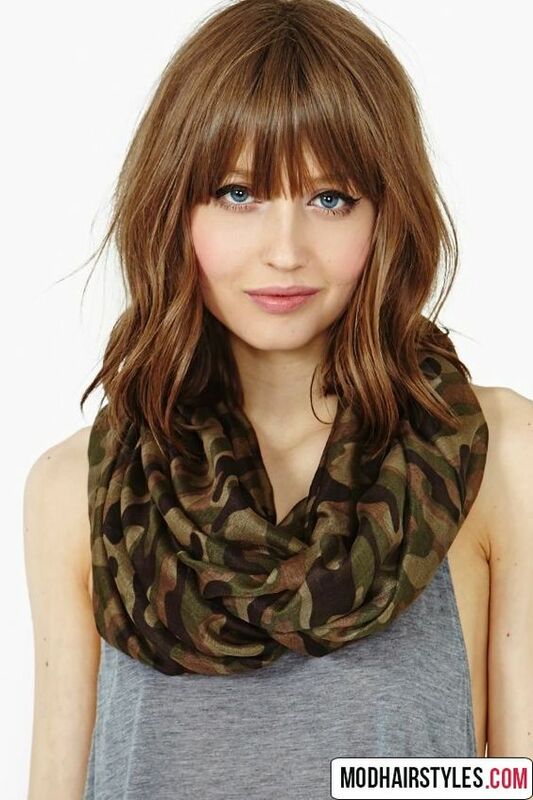 Sure, your bangs might get in your eyes every once in a while, but you will look superb while rocking this look. 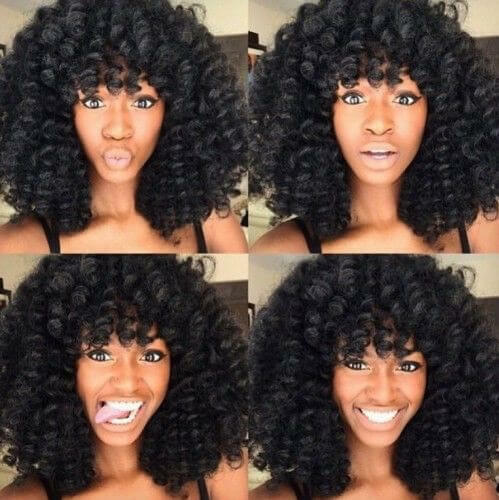 How can you not love these huge curls? Crochet braids is one of the best medium haircuts with bangs you can experiment with if you adore curly locks. 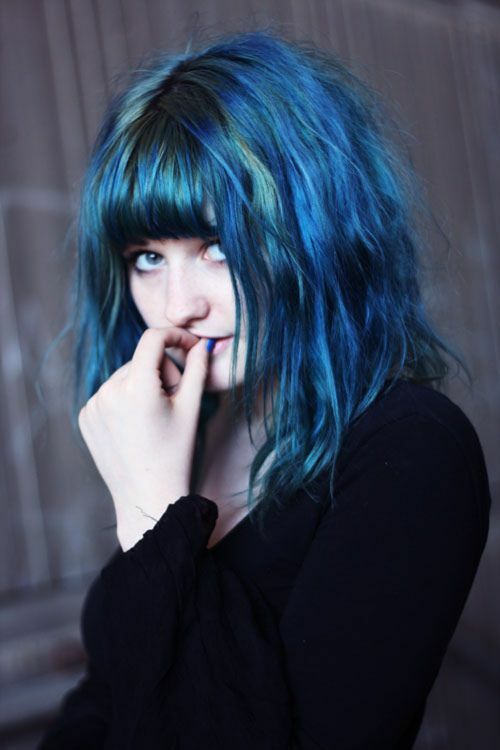 Can’t decide on what color to dye your hair next, especially when trying out medium haircuts with bangs? Try all of them! 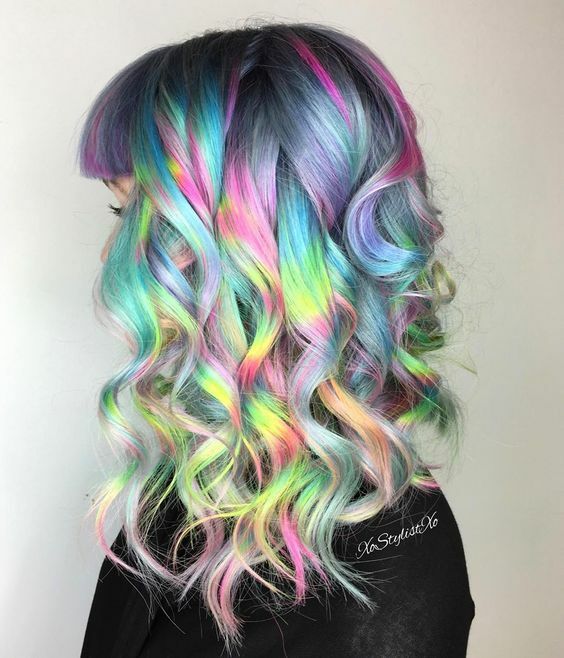 This photo shows how you can combine a series of metallic shades for one breathtaking hairstyle. 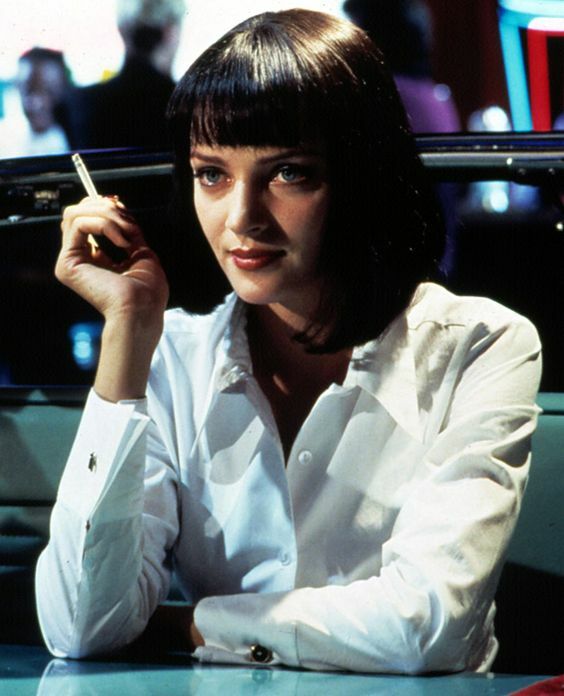 Uma Thurman’s signature haircut from Pulp Fiction is as hot today as it was when the movie came out in the 90s. 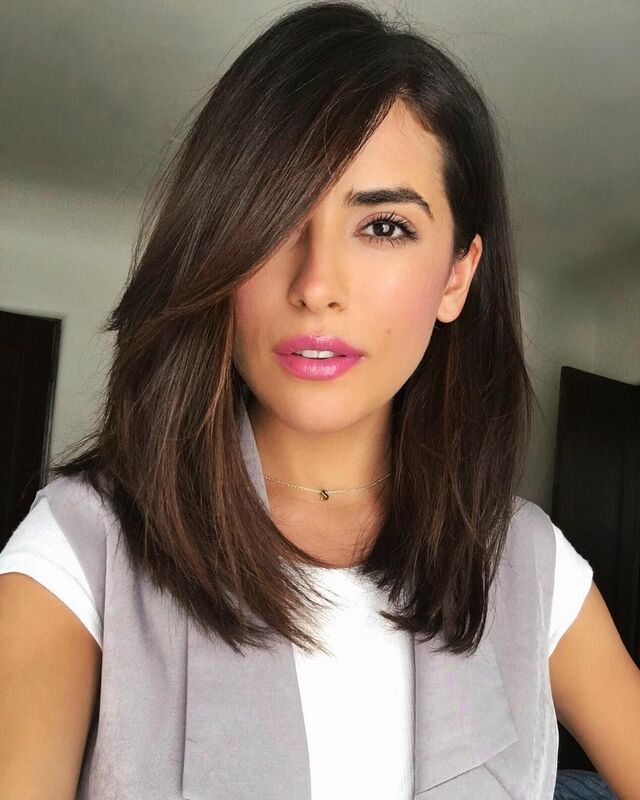 It’s classy, sassy and everything you could want from a long bob. 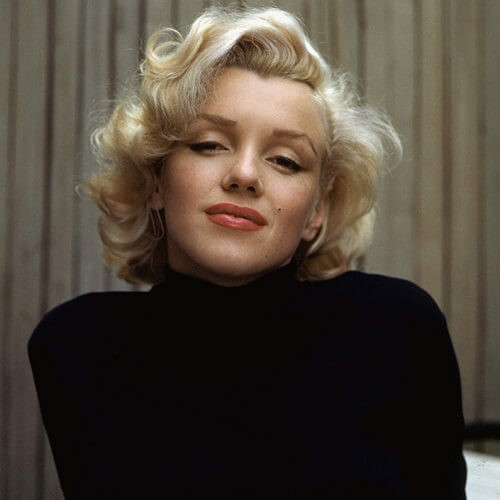 Speaking of legends, Marilyn Monroe’s signature hairstyle with curled up bangs looks spectacular on any sophisticated diva. Bring on the layers! 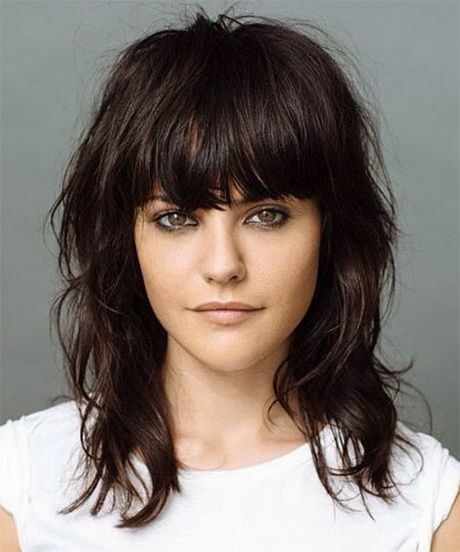 Pair your wavy and layered locks with some fringe bangs that will bring out your rebellious side. 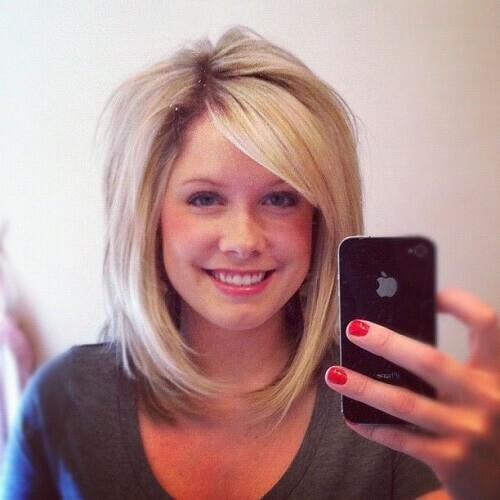 We love, love, love gals who have the courage to go for an asymmetrical bob. 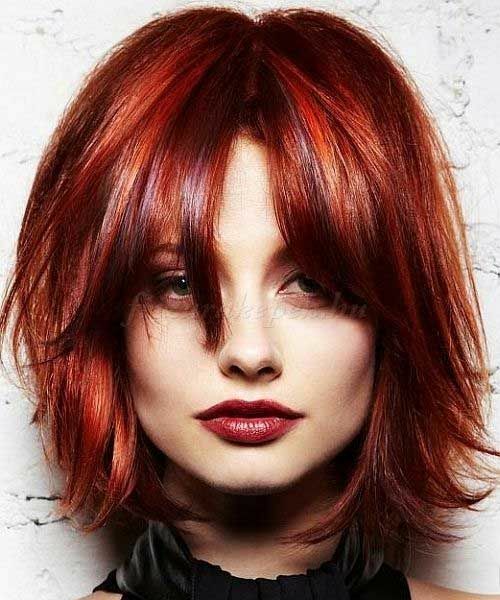 It’s a great idea if you want to get a makeover, so start cutting, master those straight bangs and even consider dyeing your hair red. The edginess doesn’t stop here. Chopped bangs were, are and will always be a super stylish choice for girls that want to bring out their inner rock star. Miss the beach? 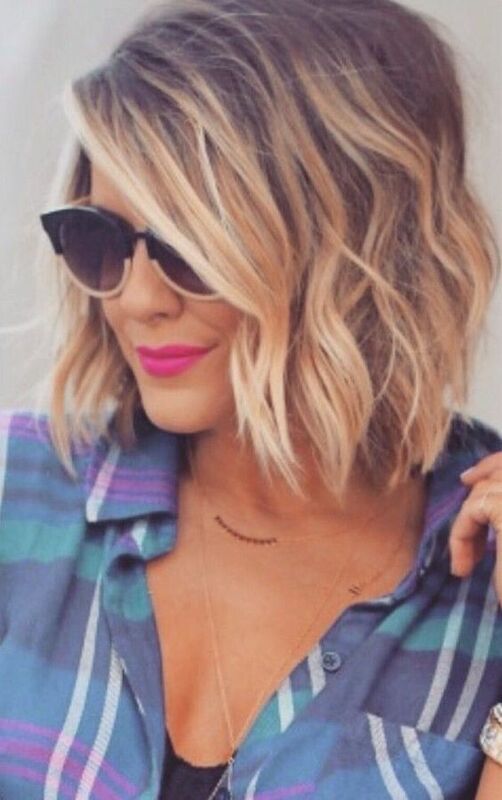 Bring the summer days to you with this gorgeous mix of blonde tones in a flawless wavy bob with side bangs. 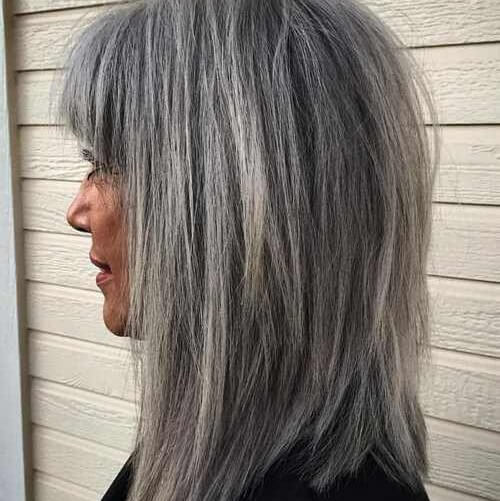 You can also go for silvery locks with a long bob and straight bangs. You’ll love it! 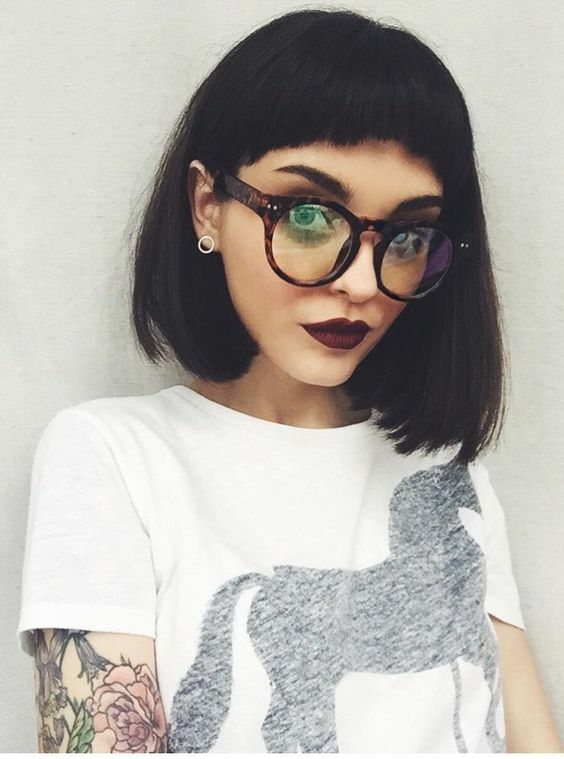 Chop your bangs even shorter if your inner artistic voice encourages you to! 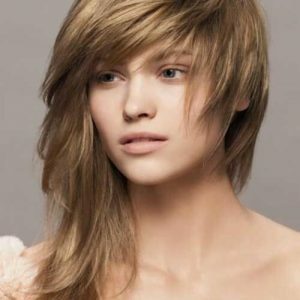 Effortless glow can be obtained with longer bangs that can be tossed to the side with ease. 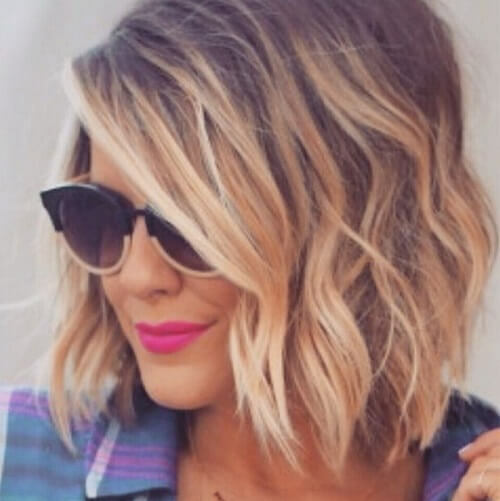 Tell your hairstylist to cut your hair inwards for a bouncy bob that you’ll be head over heels in love with. Want wavy and straight hair at the same time? 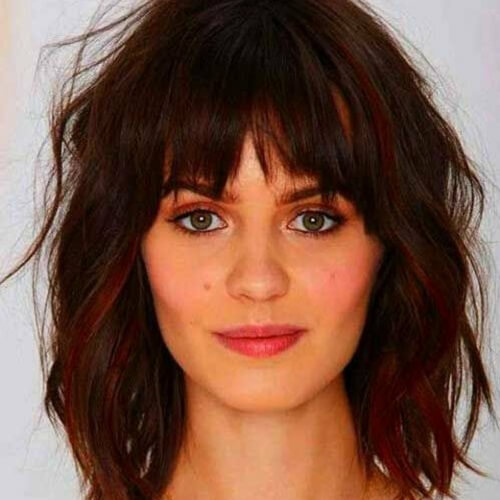 Get straight bangs with slightly curly locks. You don’t have to shave your head to get a sleek mohawk style. 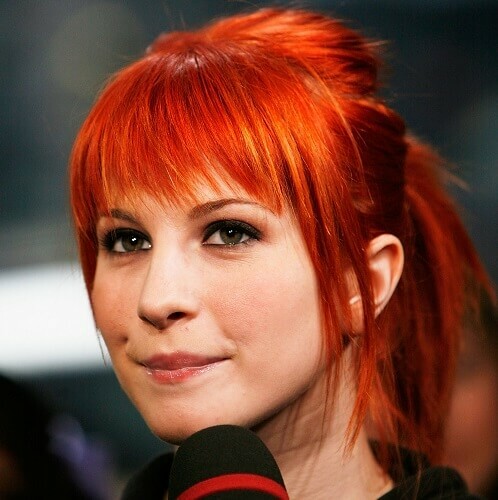 Pin your hair to the middle and let a few curled bangs grace your forehead. Don’t worry about spending hours styling your hair – the shaggy bob is totally in. The beauty of medium haircuts with bangs is that you can experiment with various hairstyles. 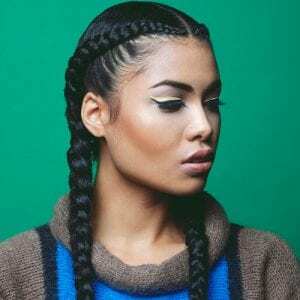 Take the twisted or braided bangs in the photo above for example. Emma Stone shows how you don’t have to go to extremes to look charming. Part your bangs slightly to the side for some natural red carpet glam. If you do have the courage to put the razor to your hair, do it with style. Use these bangs for guidance. You can also rock vintage-inspired medium haircuts with bangs like Christina Hendricks. 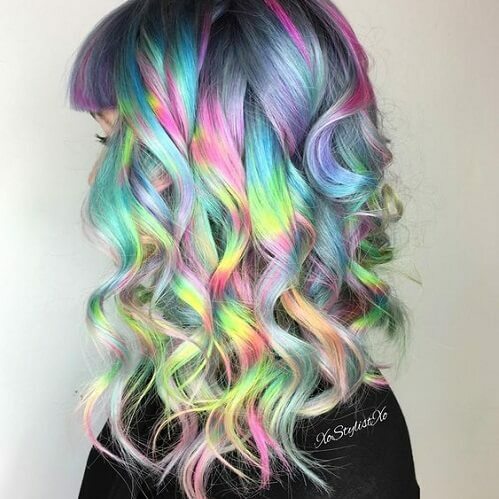 Here is the lighter version of a sweet ombre for medium haircuts with bangs. 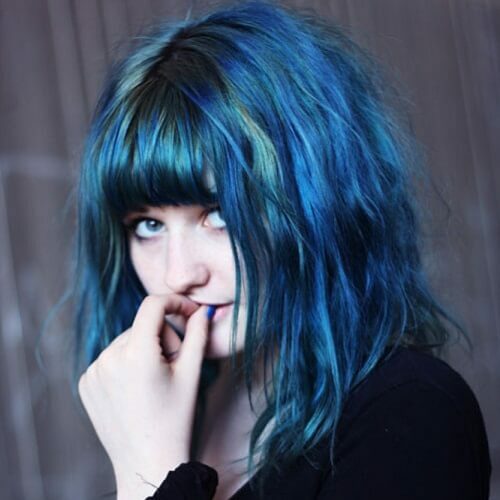 Go for some dark blue wavy locks and bangs for the rebel inside. 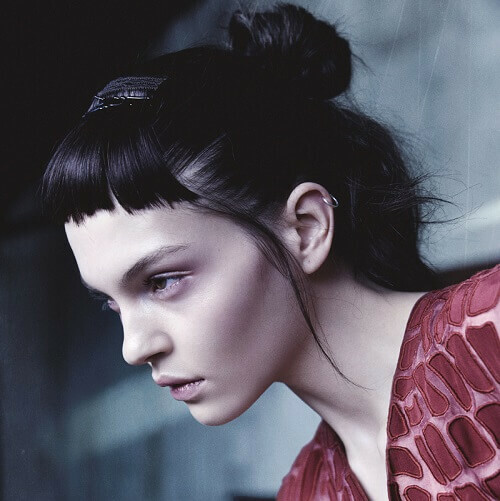 Spread out your bangs for a modern twist. Tie your hair in the perfect ponytail and sweep your bangs to the side. Another hairstyle for medium haircuts with bangs is half up and half down with a bun on the top part. 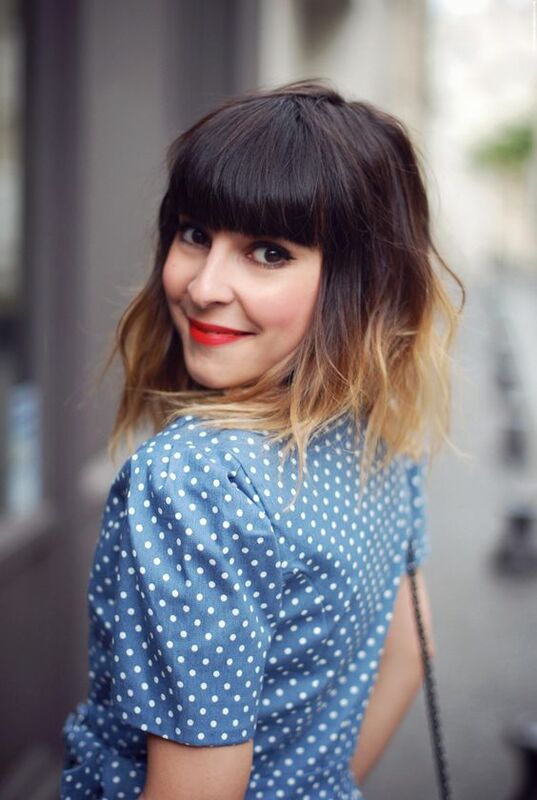 If you’ve decided to get bangs, consider making them fun, fresh and funky! Image sources: 1, 2, 3, 4, 5, 6, 7, 8, 9, 10, 11, 12, 13, 14, 15, 16, 17, 18, 19, 20, 21, 22, 23, 24, 25, 26, 27, 28, 29, 30, 31, 32, 33, 34, 35, 36, 37, 38, 39, 40, 41, 42, 43, 44, 45, 46, 47, 48, 49, 50.